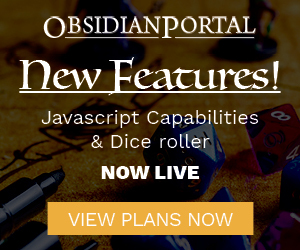 We know that the changes coming to Obsidian Portal are going to throw some people’s campaigns through loops. We’ve done our best to not bust up too many things, but unfortunately it’s a reality of the situation. Those who heavily utilize custom CSS are going to have the canvas of their beautiful paintings shifted around a bit. Because of this we have set a program into place to help assist our community, an elite task force of OP community pros who will stop at nothing to help everyone get their campaigns back into tip-top shape. We’re calling these folks Vanguards, and we’re looking to start recruiting them now! Are you up for the task of being considered one of the “the big guns” when it comes to squashing post-reforging CSS issues? Tonight we’re joined by GM Steve Wollet, winner of January’s Campaign of the Month acting as co-host. He gives us some cool tidbits from his game and discusses lots more with us. Also be sure to hit up our Tell Us About Your Character contest, as well as the d20Monkey caption contest! We’re also going to DDXP this week so be sure to tell us what you’d like to see while we’re there!